One of the best initiatives of speculative fiction from the past few years is the birth of the webzine International Speculative Fiction. Starting with April 2012 International Speculative Fiction showcased articles focused on the science fiction and fantasy scenes from across the world and from June 2012 began to release a free downloading magazine that published mostly non-Anglophone short fiction. So far, International Speculative Fiction released 3 issues featuring fiction written by Aliette de Bodard, Joyce Chng, Rochita Loenen-Ruiz, Cristian Mihail-Teodorescu, Gerson Lodi-Ribeiro, Marian Truţă, Nassau Hedron, Lavie Tidhar and Ken Liu. 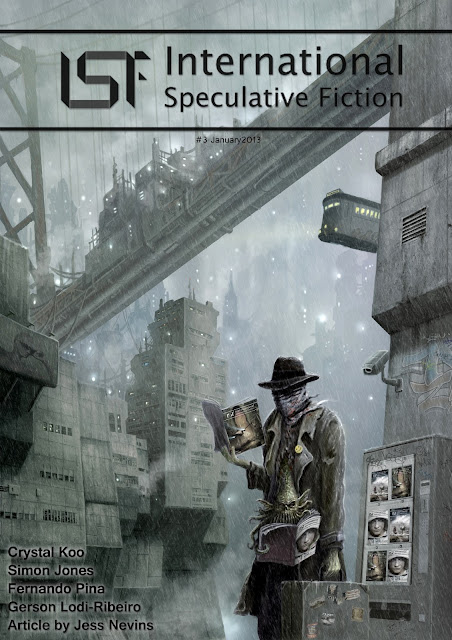 The 4th issue of International Speculative Fiction is due to be released on January, 25th and it shows an encouraging growth for this excellent project. For the first time the readers can find four short stories and a four non-fiction pieces, an article, an interview and two reviews. I absolutely love that cover art.